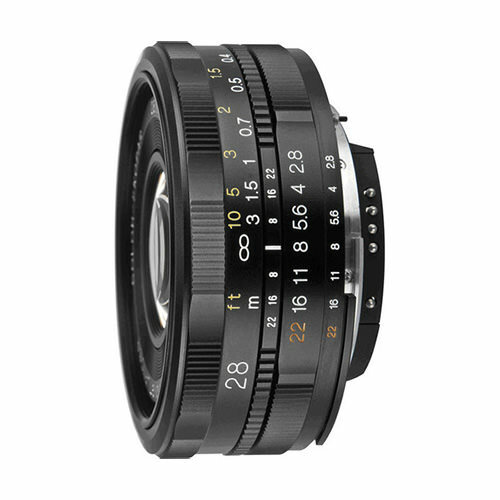 Lens Description: The 28mm f/2.8 Color Skopar SL II Lens for Nikon from Voigtlander is an extremely compact 28mm prime lens. A true wide angle lens, its angle of view on full frame cameras is 74.8º and on APS-C sized cameras is 53º. With a maximum aperture of f/2.8, it is bright and fast enough to handle low light situations and it produces sharp images with minimal aberrations. Its manual focusing ring handles well and its operation is particularly smooth and accurate. This is a well-crafted lens integrated for automatic metering on Nikon SLR and DSLR cameras and is also a good option when shooting video.